It occurred to me the other day that I’ve been knitting for a little less than a third of my life – which in the grand scheme of things isn’t very much, but in the scheme of hobbies is relatively huge. Sure, I was gangbusters for cross-stitch needlepoint before I took up knitting, but that didn’t last nearly as long as my love of knitting has. How many hobbies have we all taken up that didn’t quite stick? I mean, the universe seeks balance, and so forth, which means there’s got to be scads of crafters out there who took up knitting for like, a month or two, or long enough to churn out a baby blanket or a few scarves as gifts, and then discovered quilting or sketching or glass-blowing or something and decided to ditch knitting forever – and that’s totally groovy. Do as pleases you, crafters, because goodness knows knitters hate too much competition at the yarn sales. (I kid. Sort of. ::cough::) But man, I cannot even remember what I did to fill my time before knitting came along. Like, are there people who go through the world without a portable knitting project stuffed in their handbag/backpack/briefcase? How do they manage? I take a great deal of pleasure in having knitting around at home, but also in those little gaps of time when I’m out and about. I rediscovered this in full force the other night, when I sat in the first session of a photography course that I’m taking this term through the local college continuing education program. (Up until about a month and a half ago, every single photo I have taken for this blog was with a $200 point-and-shoot camera. I recently finally collected enough cash for a proper DSLR, and I love it. Now the trick is just to learn how to use it.) Turns out the class is going to yield plenty of sitting-and-listening time along with practical instructional time, and combined with the waiting around at the beginning of class, I got a decent amount of my Malabrigo sock knitted. The instructor doesn’t mind me knitting, I can listen and focus better if my hands are busy, and I have knitting and knowledge to show for my time. This is a win on all counts. Although I fully expect I have now been mentally labelled as ‘that weird knitting girl’, I also don’t care, because dude, nobody else in that class is going to get a pair or two of socks after sitting there for 10 weeks. (I bet they’re all jealous.) 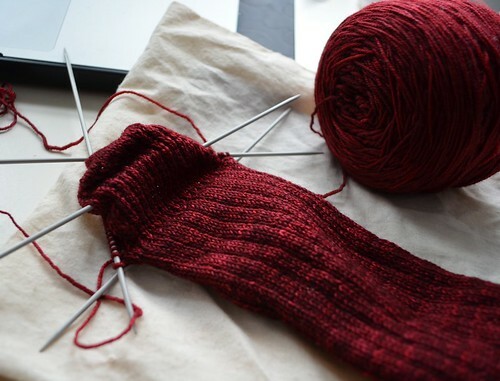 I hadn’t thought of officially going for a “12 in 2012” project this year, but unofficially I was thinking that 12 pairs of socks would be nice, and now I think it would be absolutely do-able. Hurray for portable knitting projects in the handbag! In other sock news, I’m pleased to announce that the sock pattern I contributed for the Tanis Fiber Arts 2011 ‘Year in Colour’ yarn club is now available in wide release. These were the offering for March of last year, and the colourway Tanis produced for it (Clover) is just gorgeous. I don’t know if she’ll be including it in her roster of regular yarn colours, but I may or may not have already tried to peer pressure her to do so. It’s a wonderful leafy green, and even on a snowy day like today is a nice glimpse of spring ahead. Happy knitting, this Thursday! I’ll have more adventures to report on next time. My BKF just asked me that question the other day, what did you do with all your time before you knit. And the answer is many things, the stained glass phase, the year I stripped 100 year old woodwork for a home renovation, the books I wrote and published, the year of papertole, the year I learned to garden or the year I took up French cooking. I sort of thought knitting would be like all the rest — that my initial enthusiasm would dissipate over time and I’d be a person who knits rather than “the knitter” — hasn’t happened yet, and it’s hard for me to imagine it ever will. But we’ll see. Very pretty socks and so spring-like. i love, love, love this sock design!! i’m a knitter/gardener…any leaf/flower design catches my eye!! lovely! I loved those Marching On socks the second I saw them! Y’know, I commuted 45 mins -1 hr each way, 5 days a week for 3 years of university, and I didn’t really knit back then! What an extreme waste of time. I get all worked up when I think a bout all the knitting I could have gotten done on the bus/train/metro… and instead I was studying! What was I thinking? I also focus better when my hands are busy! I find my mind wandering and attention disipating if I’m in a seminar-type scenario without something to keep my hands busy. Once the knitting comes out, it’s like my focus becomes honed on the speaker and all the other background noise filters out. But woe to me if I forget something to knit with, or if it’s a big formal meeting-type event. Would they rather me knit and focus, or randomly start yawning and doodling and get my attention completely arrested by my restless mind? Knitting takes up *just* enough mind and body activity to leave the rest of me able to focus. I read a lot of books before I took up knitting. I stil read, but now that I have a Kindle, my library is portable. I take it with me instead of a knitting project. Lovely socks….. and i was thinking the same thing the other day…. “what did I do before I was a knitter? Off to knit some more! BTW…. love your blog, I’m a regular reader, but never comment…. Love your patterns too! I learned how to knit since I was 8 (I’m 33 now), though it’s only been the last 10 or so years that I’ve been obsessive about it and collecting stash. I think before knitting I used to read more! I really like that sock pattern! It’s beautiful and I think socks need to be beautiful! I know people that knit in church so knitting in a class isn’t so bad. I knit at work on breaks and at lunch and when I fill in for the receptionist. Some, including the president of the company, think I’m a little loony but I don’t care. Knitting or crocheting are my de-stressors so…. I’m glad I have found a dead set mad crazy knitter such as myself. I thought it was just me, but no. lol. I learnt to knit when I was 5 years old, have dabbled in many other crafts and always gone back to knitting. I have recently turned 50yrs old!! I think we try other crafts just to make sure we don’t miss out on anything, but the true love is what we always go back to. Knitting Rules!!! Have a great day. I’ve always knitted. I took up piano for about 10 years, but then I started knitting and designing in earnest, and that took my focus off piano. There’s a lovely grand piano in my living room that hardly gets played, but it has a knitted Gromit dog on top. Enjoy your photography class! I took photography in high school and college with my film SLR, and I miss that control. I’m still not willing to buy a DSLR, because I don’t think I’d carry it around with me. It would be an extravagance to buy it just to take pictures of my knitting at home….or would it? 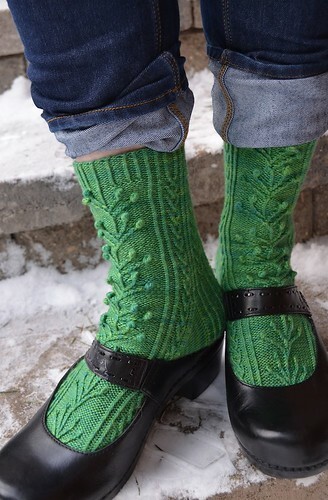 Those are lovely springtime socks! These socks are gorgeous! Nice post as usual! I recently learned how to make socks and I am so happy I did. After the first pair for my husband, I completed one for me and they are the best solution to cold feet in snow weather I have ever found! I just started a second pair for me 🙂 and I’ve realized that using cheaper yarn is not as fun! (I bet it won’t be warm either) so I am making the resolution (it is still January 🙂 to save to buy only high quality yarn! Is that Tiziano Red? I need to get some, it’s gorgeous. And I really need to knit some socks – I just finished a crib size baby blanket and I’m kind of sick of vast expanses of pattern repeats. I took up knitting in university, and got into it with a vengeance afterwards, so I’d say it took the place of studying! That being said, I tried all sorts of crafts through high school and the first few years of university (candle making, cross stitch, paper crafts, origami, beading, collage…) but knitting is the one that stuck. I thought the same thing about knitting when I started. I assumed it would fade before long, like my hobby attempts. But it has just kept building on itself and I’m more into it than ever. I have to say, I imagine the people and professors at my university find me slightly more unique. I am a 21 year old guy who knits while in my physics and math classes. I also knit at work. My astronomy professor stopped a few minutes into our first class, stared at me for a moment, then burst out laughing and said, “I’ve seen a lot of wierd things happen in my classroom, but this is one of the strangest.” I just smiled, shrugged, and kept knitting. I’ve often been refered to as “That one kid who knits” (or they say crochets, but I just ignore that). Anyway, I really enjoyed your post today because it struck home with me on many levels. Thanks! As for me, reading took up some of my time before, and I also did cross-stitch for quite a while. But mostly, I just fidgeted, or sometimes doodled. Knitting has saved me from a lot of broken stuff that I fidgeted with until it broke, and self-injury, because my fidget objects consisted of whatever was handy, which sometimes included scissors and staplers and other such things. I ask myself the same question. I’ve knitted and crocheted since I was a child but took breaks here and there. I think i washed down walls or something because I’m so darn fidgety to begin with and I also smoked cigarettes. I read a whole lot of books … but luckily I’ve discovered the joy of audiobooks. I am making a cup cozie to practice using DPNs. I cannot wait to make socks. I usually knit with nothing smaller than a 10, so it is interesting. I love the instep on those socks. It always adds a touch of elegance in my eyes when there’s a design that arches with the arch of the foot. I read a lot more before I knit, and picked up various little crafts here and there. I had a friend who knit for a bit and then turned to crochet, and one friend who reverted back to cross stitch after trying out knitting. I wonder what it is that calls to us from certain crafts and time-filling activities. Such beautiful sock yarn. The color is very deep? I really related to your post. I feel so much the same about discovering knitting (I used to cross-stitch before too). I knit on public transportation, waiting for public transportation standing up at a wind shelter. The traffic at the intersections sometimes gawk if I look up to notice, but like you, I don’t care. I’m always so thrilled to have a few minutes for a few stitches in an otherwise busy day of “have to”. Congrats to seeking further education for the photos. I’m happy if I take any that get somewhere beyond a local drive folder. Hello! I really identified with this post. Since I have only been knitting for a year I think I can answer that question. People who don’t knit spend a lot of time doing nothing while they wait on others! I sat through so many meetings and lessons (for my son) with nothing to show for it. Now I have fantastic hand knit socks, scarves, and hats to show for my waiting time. I don’t think I can ever go back to not having something to knit. I carry around a small project bag in my purse. It’s great! I love this blog. I knew I needed to be a regular reader when I read your post about yarn overs. You’re such a good writer and teacher. Love love love your socks! As for people who have no knitting hiding in their briefcases and purses…. I dream of living in a world where I don’t have to ponder whether or not I can bring out my knitting while sitting in a meeting. Funny how many people think it is an outright “dis” if you have knitting going while listening. I totally understand, I really wonder what I did for entertainment and stress release before knitting. And I have only been knitting for about four years. I guess everyone has their thing they like to do that they couldn’t possibly replace with anything else. That’s knitting for me. are those susan bates quicksilver dpns? funny thing is i have a pair of SIGNATURE dpns and am using my quicksilvers over them… i like em! hahha.